admin 권한으로 명령프롬프트 를 하나 열고, powershell 로 들어가자. 그리고 powershell 에서 아래 명령어를 실행하자. 그리고 windows 를 restart 하자. 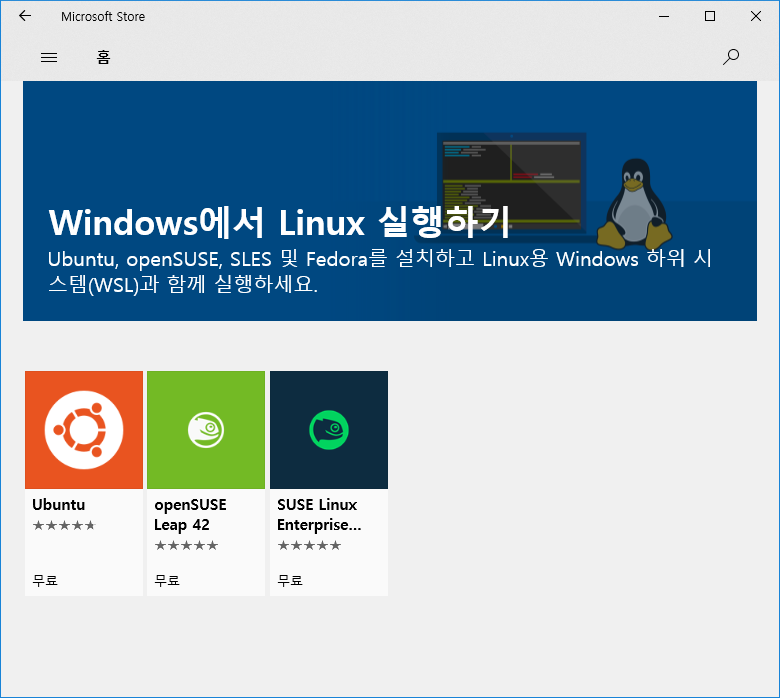 여기서는 Windows build 16215 이후 버전과 관련해서 설명한다. 현재 지원하는 windows distros 는 3개 정도이다. 아래 3개중 하나를 택하면 download 가 시작된다. 다운로드가 완료되면 설치를 눌러주자. 설치가 끝나면 아래처럼 계정을 하나 만들게 된다. 계정이 만들어지면 자도 login 이 된 상태로 prompt 를 하나 보여준다. linux 는 아래 경로에 있다. 참고로 '실행파일' 은 보안(security) 설정을 해서, 실행권한을 넣어줘야 exe 파일을 직접 실행할 수 있다. How do I change mirrors in Ubuntu Server from regional to main? 해외보다 국내 서버를 쓰는 것이 빠르다고 해서 일단 적어놓는다. MariaDB - Setting up MariaDB Repositories - MariaDB : 여기서 command line 에서 repository 를 추가하는 법을 알려준다. 위처럼 repository 를 추가해주자. 그래야 python-pip3 package 를 설치할 수 있다. 모든 Linux app 들을 WSL 에서 실행할 수 없다. 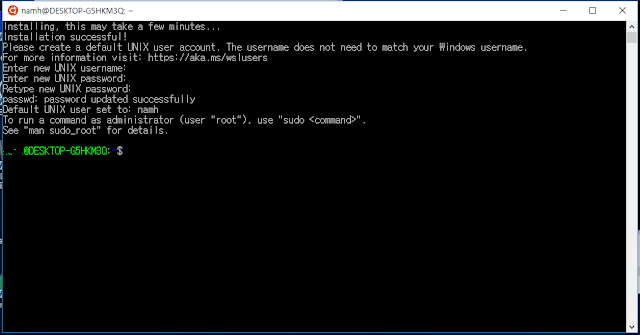 WSL은 windows 에서 bash 를 실행하려고 하거나 core linux command-line tools 를 실행하려고 하는 유저를 위한 것이다. 그래서 GUI desktop 과 applications 들은 지원하지 않는다. 많은 server application 을 실행할 수 있지만, MS 에서는 WSL에서 server 를 돌리는 것을 추천하지 않는다. Also, even though you will be able to run many popular server applications (e.g. 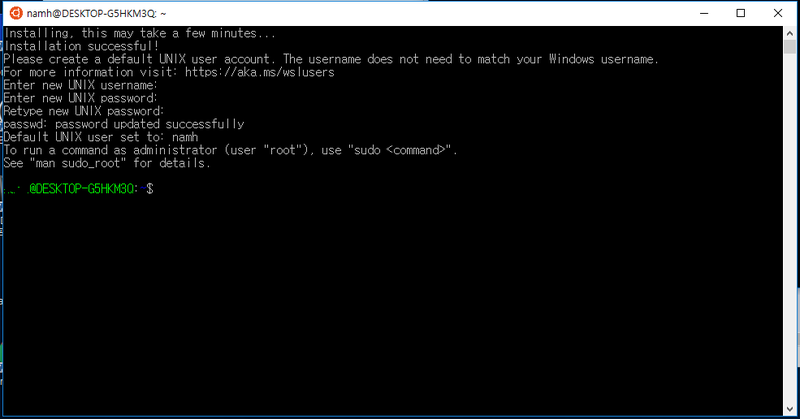 Redis), we do not recommend WSL for server scenarios – Microsoft offers a variety of solutions for running production Ubuntu workloads in Azure, Hyper-V, and Docker. windows 의 path 는 /mnt/ 에 drive 가 mount 되어 있다. /mnt/c 가 c:\ 이다.